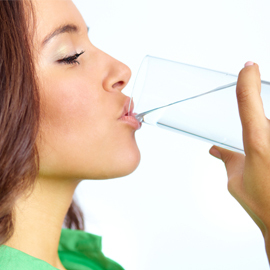 Home » Wellness Blog » Water: How Much and What's the Best Source? Water: How Much and What’s the Best Source? Since a significant percentage of the human body is water, there’s no doubt that it’s known for its anti-aging and weight loss properties. We keep hearing and reading that it is important to drink enough water per day. But how much water should we be drinking and from what source? The standard answer as to how much water we need to drink is eight full glasses a day, or 64 ounces. However, that figure doesn’t take into account weather and the amount of physical activity a person is engaging in. Clearly, someone that is highly active will need to consume more water than someone that’s sedentary. A person who is in a medical weight loss program and is exercising moderately or vigorously will need to ingest more water. In a similar vein, if you’re sweating a lot during a weight loss workout, you’ll need to drink more water to replace the lost perspiration. Weather is another important factor that plays a part in how much water an individual needs to consume. In Beverly Hills or Bakersfield’s hot weather, people naturally need to drink up to keep themselves hydrated. Dehydration can lead to headaches and fatigue, but can lead to heat exhaustion, or worse, heat stroke. It’s important to follow common sense and up your water intake during hot weather or physical activity. Now that you know how much water you should drink per day, what’s the best source? Although one would think fresh water is a good source of water, the fact is it may be contaminated with chemicals. It’s true that tap water is treated, but it also contains chemicals. While bottled water may be thought of as being safer than tap water, studies are being conducted to refute this claim. That leaves water from a water filtration system. A water filtration system removes chemicals, impurities, and microbial contaminants from tap water without impacting the pH or mineral levels of the water.